Ongoing Bible study groups meet every week with no predetermined ending date. Sunday School is an example of an ongoing group. Resources for ongoing groups have advantages that may encourage you to take a second look at the value these resources bring to the group. Balanced study plan. This is arguably the biggest advantage. Half the battle of leading a group is figuring out what to actually study. If left alone, most of us teachers will gravitate to our sugar sticks, teach what we already know, or teach the things we know we are already doing. Ongoing resources that follow an organized and reasoned plan help me find balance within our group study. Forces me to go to the hard places. There are some topics that are just difficult or that I would rather avoid in a Bible study group. Using an ongoing resource and sticking to their plan challenges me as a leader to tackle some of the difficult topics found in Scripture. Removes suspicion. Some people always seem to be suspicious. They wonder why we studied what we studied thinking that it was directed toward a person in the group (but rarely toward them). Using ongoing Bible study resources eliminates this since we are simply following the scope and sequence for that particular resource set. Saves time. Examining a Bible passage, determining a specific direction, crafting question sets, and putting together a plan all take time. Using an ongoing resource set gives me back some time in my week. I may not use everything provided, but I have it if I need it. Frees me to teach. Some think that using ongoing resources enslaves them because they feel like they need to cover everything in the book but instead I choose to look at how it frees me. Using a resource gives me the freedom to focus on one section in that resource set knowing that the group can use the resource outside the group time to look at the other sections we didn’t cover as a group. It would be silly to think the only way they will cover a passage is when they are sitting in the same room with me. I need to free them to study on their own. Benefit of multiple scholars and voices. In most ongoing Bible study resources, a variety of people with different skills and expertise have contributed. These resources also tend to endure multiple reviews. No one person fully understands all the nuances of every passage, doctrine, or teaching approach. Multiple voices strengthens the final resource. Adapting is easier than creating from scratch. Even if I don’t like the teaching ideas or questions, I at least have a starting place from which to build. For me, I would rather adapt than create out of nothing. Cost effective. Most ongoing Bible study resources are printed in larger numbers which keeps the cost down comparatively. Tool for those unable to attend. Ongoing Bible study resources usually include a resource for the individual participant and the leader. That means even those who are unable to attend a group meeting can still benefit from Bible study if they have the participant resource in their hands. I sometimes forget that Bible study can and should happen even if a person is unable to attend. Tool for inviting those who should attend. I can use the participant resource as a tool to invite people to attend our group. Since the cost is usually less than other options, doing this will not break the bank. Providing the resource can also remove some of the awkwardness when they ask what we do in that Bible study group. What other reasons might you add to this list? There are admittedly many Bible study groups that are sick or dying. We could take the time to investigate symptoms and reasons a once healthy group slips into discouragement, dysfunction, or disrepair. Oftentimes we classify a group as sick or dying because of a lack of strategic focus, “sin in the camp,” or loss of attenders. No matter what has caused a group to become sick or dying, let’s highlight three ingredients that can help a group come back to life and to experience good health. With renewed purpose. 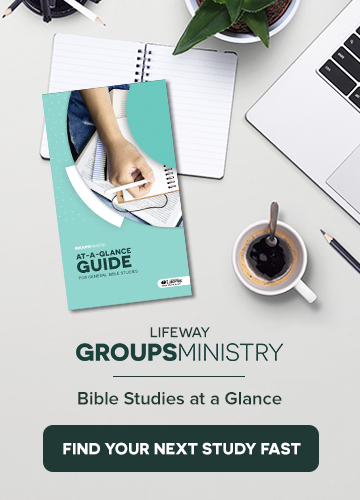 Every Bible study group is designed to focus on and celebrate ways God works through His Word, through reaching and ministering to people in the community, and in making disciples. Most groups start out being outward focused where we intentionally have room, resources, and resolve to include new people. Many groups become inward focused where we are more interested in meeting our own needs than in expressing the ministry of the Gospel to others. God works through His people who intentionally serve Him as they seek individuals to engage in and apply His Word. We will always have fields that are white unto harvest. God knows what He is doing when He moves people and people groups in and out of our field of service. If people do not come to us, certainly we need to go to them! Your group can intentionally refocus with new target group(s) and new or renewed workers. With repentance. God always invites and expects His people to adjust back to letting Him work through individuals and through the group for the sake of His Kingdom. Prayer, obedience, and humility before the Lord are vital aspects of a healthy group of believers. One of the key words in our restored “health” is “adjusting.” One of the key realities of God’s Word is that God is at work, and He invites us to join Him at work. We must remember that we work for Him rather than that He works for us. With rejoicing. We experience renewed health and life when we acknowledge that God is at work in and through our group. God allows us to experience divine appointments, and we get to call attention to God’s work and His timing when we benefit from it or not. Health comes from the Lord, and we celebrate what only God can do. Discipleship comes when God works in and through us. We can celebrate ways He trains, corrects, and stretches us for the sake of the Kingdom. What if only a few people join us as we study, minister, or share together in Christian fellowship? We get to celebrate that we are part of His great Kingdom work. We also get to celebrate as God gives opportunity for people to leave our group and serve elsewhere in His field. Will you be part of renewed purpose, repentance, and rejoicing?